Serwotka’s response to legitimate questions of union members leaves a lot of questions unanswered. The decision of the PCS Union’s National Executive Committee to suspend the union’s internal democracy as it relates to elections for the NEC and group committee is understandably a very contentious one; it is also one I disagree with as I have set out before. The branch also asked why the NEC had relied on a supplementary rule of the union to suspend elections that are required by a Principal Rule of the union when these Rules require that in the case of any conflict it shall be the Principal Rule of the Union that shall take precedence. On 27 February Mark Serwotka responded to the branch, the letter is available to read here. Readers can have of course make their own minds up on Serwotka’s response but to me it fails to really grapple with the questions that were posed to him. No one is going to disagree that the attack is an ideological one, particularly given the PCS’ offer to fund the running costs of check-off, a point reinforced by Danny Alexander’s “no fiscal case” letter to Permanent Secretaries sent from the Treasury. But Serwotka’s response, in detailing the time line doesn’t answer the question why the NEC felt it had no alternative but to suspend elections with no consultation. He has said clearly that the decision was not a surprise and that this issue was a constant one through the last year; it was surely right for the union to politically campaign to avert the possibility of check off being removed but his answer seems to come down to the following: we couldn’t consult because we didn’t know how many people would switch and so, and I infer this (it is not set out clearly) therefore the union did not know what the financial implications would be for the union until we had gone through the process in one department, namely the Home Office. With that information the union could set a benchmark for what kind of income loss the union could reasonably expect. 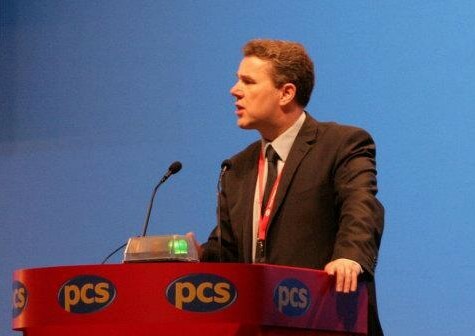 An accurate assessment was always difficult but, as Serwotka has said elsewhere, this was always a “herculean task” and other union’s faced with such a threat have consistently fared less well than PCS have in retaining over 70% of its membership. Therefore, it seems to me that with the real prospect of a withdrawal of check off there were good reasons for believing the financial pressures on the union would be worse than they actually now are. Consulting members earlier on the financial situation and actions the NEC would consider as a result of this would then seem to have been a more responsible course of action. There may be a reason why earlier consultation with branches was not practical, even though there was a clear financial threat to the union that was known for a long time (e.g., negotiations behind the scenes in confidence). However, if there was it is not one Serwotka has explained here. I am also conscious that I am criticising Serwotka’s reply but in fact he was for significant periods – quite reasonably due to ill-health – not available to lead the union and so the blame for this failure to consult does not rest with Serwotka himself. On the question of what other thoughts were given to other forms of elections which would be less costly there is, as far as I can see, no response given. In respect of the second question what is noticeable is that there is no real attempt to answer the question at all. It would have been quite easy to answer to say this is a complex matter but the union sought legal advice who advised that their proposed actions were lawful and while regrettable felt the NEC had to take the course of action it did. Instead, it failed to engage on the question of the Union Rules at all – that failure to address the point at issue is itself quite telling.